Konstantia Gourzi spans bridges between cultures and epochs across time and space. She does this as a composer, where she finds her voice in unifying elements that seem to have nothing in common. She also does it as a conductor and teacher, where in consonance with others she constructs a new world of equal opportunities, between male and female, the strange and the familiar. A Greek now living in Germany, Konstantia Gourzi was born in Athens in 1962. She knows that finding artistic authenticity today is a particular challenge. Even more so since technical progress offers composers almost unlimited access to the musical creations of all times and places. The more one is affected by different stimuli and the more one has to process them, the greater the challenge in finding a clear, yet individual artistic voice. However, the greater also the spectrum for inspiration. Of course, in Konstantia Gourzi’s case, her specific cultural background plays a major role. On the one hand her Greek roots were a strong influence, which are inseparable from the early Christian Byzantine traditions, and the influence of oriental musical cultures on Southern Europe. On the other hand, she is also embedded in the western world, with its polyphonic canon and the international avant-garde of modern instrumental development, and building on sound, noise and structure research. Konstantia Gourzi’s creativity stems from the tension between these opposites. It was a lucky stroke of fate that, at thirteen, Konstantia Gourzi became a student of the composer Michael Travlos in Athens. He was a former student of Isang Yun. Throughout his life, Yun had tried to blend the ancient traditions of his Korean homeland with contemporary impulses. Archaic roots interacting with a revolutionary search for and exploration of new stylistic methods – this could also be a motto for Konstantia Gourzi’s own work, and it was a driving force behind her own quest for her creative identity. In 1987 she moved to Berlin to partake in Franz Martin Olbrich’s composition class. Konstantia realized most of all the necessity to auto-define herself and to rely on her own resources as a composer. However, Germany‘s rich musical life had much more to offer. A course in Darmstadt, by Diether de la Motte, gave her the freedom and confidence to experiment. Immersing herself in György Kurtág’s vibrant miniature cosmos opened up unimagined new perspectives. In parallel, she studied conducting in Berlin. Her conservatoire course was another sobering experience. 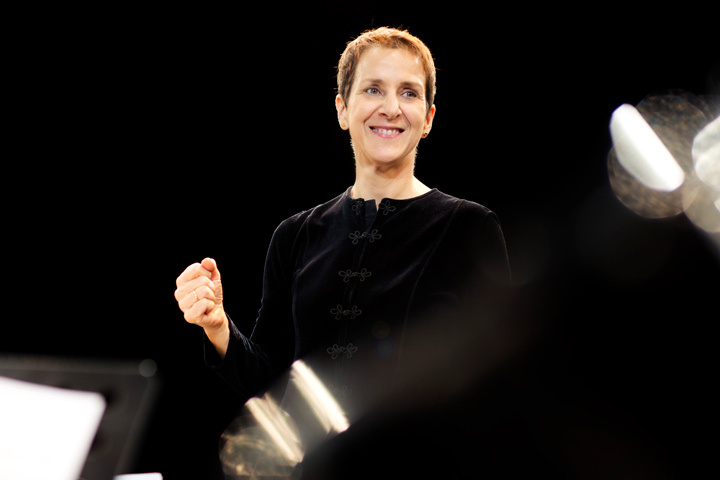 Nonetheless, for four years, she attended almost every rehearsal of the Berlin Philharmonic, and acquired crucial experience in tangible music-making of the highest level. Above all, Claudio Abbado, whom she assisted, showed her “how music can breathe”. Günter Wand, Carlo Maria Giulini, Michael Gielen, Bernard Haitink, Nikolaus Harnoncourt and Giuseppe Sinopoli were also powerful contributors to her inspiration, Her most important insight she derived from them was the recognition that the level of respect and kindness in the interaction with the orchestra reflected the musical quality of the artistic creation. Konstantia Gourzi embodies what today is a rather unusual, but extremely prolific combination of composer, conductor and teacher. Teaching requires all her rational capabilities: as a forward-thinking and judicious organiser, a results-orientated worker and an empathetic communicator. She understands what it means to continually follow many paths, to develop and turn creative ideas into reality step by step, to give her ensembles a clear identity, and through the quality of her work to earn respect and recognition from all. As early as 1991, she founded the “attacca berlin” ensemble, and the “Zeitzonen” international concert series. She also led the “Echo” ensemble from 1999 – 2007. In 2002, Konstantia Gourzi was appointed professor at the Hochschule für Musik in Munich. Ever since, she has shown impressive versatility and characteristical verve and alacrity soon advancing to become one of the central pillars of the new music scene in the Bavarian capital. Her first big project in Munich was the founding of the “ensemble oktopus” for modern music made up of students that she still directs today. It is not possible to imagine cultural life in Munich without this ensemble any more, with its stylistic flexibility and ambitious interpretative standards. With this continuous work she enables the conducting students to gain a feel for contemporary music in all its facets. She helps them to develop an authentic relationship with the new and the unexpected, and she is a consistent and inspiring mentor to all young musicians who prove themselves to be genuinely interested. In 2007, Konstantia founded the “Network and Ensemble opus21musikplus”, in which contemporary music enters into a symbiotic relationship with other art forms and musical directions. As a conductor, who is unafraid of any challenge and who, with her long experience, commands a precise and brilliant technical capacity for exceptional performances, Konstantia Gourzi has long achieved international presence as conducter as well as composer. As a composer, Konstantia Gourzi explores musical and sonic phenomena in her inexhaustible and constantly expanding range. Above all, she is interested in the intuitive, irrational parts of the human psyche. Her music is never purely intellectual or conceptual; her experiments are, at the core, based on a profoundly sensed experience. That means that intuition and sensual experience always play a vital role in her creative processes. In her music, she seeks to go beyond the limits of the rational, the definable, allowing the music to take its own shape from the forces within itself – where the distinction between fixed contours and improvisatory freedom is often transcended. This may lead to the impression that everything new, just being created, has yet always been there; that the current and the timeless meld into each other. Time and again this conjures up dreamy, magical spheres with other-worldly rituals. This other world appears like an undercurrent within our familiar world that exists at the same time. It helps reality to appear to us in a different light, and subtly frees us from our conditioned preconceptions.